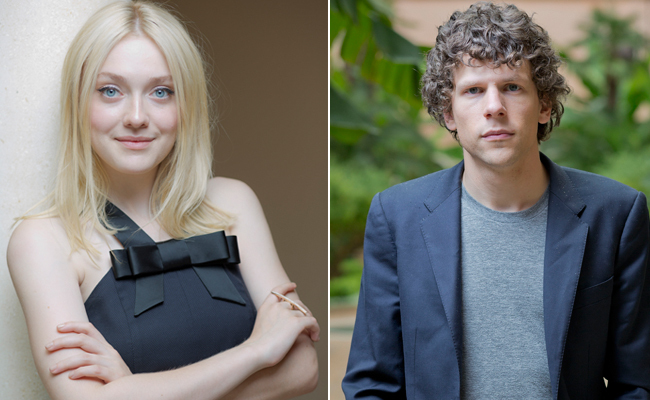 Night Moves (Dakota Fanning, Jesse Eisenberg) and Palo Alto (James Franco) made lasting first impressions. John F. Kennedy assassination flick Parkland did not. The 70th Venice Film Festival has been underway for days now, and everyone in attendance has a favorite among the movies screened so far. For me, nothing has toppedNight Moves, Kelly Reichardt’s disquietingly beautiful, deeply intelligent thriller about radical activism and its consequences—both material and moral—in 21st century America. A high point of the director’s short, though distinguished filmography, the movie tells the story of three Oregon environmentalists who plot to blow up a hydraulic dam, the emblem of an industrial culture they see as ruining the world. The central figure is Josh (Jesse Eisenberg, right), a reserved young man who works on an organic vegetable farm. His partners in protest are Dena (Dakota Fanning), a college dropout from a wealthy family, and Harmon (Peter Sarsgaard), a jaded former Marine. The first half of Night Moves details the trio’s preparation for their mission: the brainstorming, the logistical setbacks and re-adjustments, a bit of bickering, and a hint of a love triangle—though the rigorously melodrama-averse Reichardt wisely never pushes that angle. Through small, perfectly observed moments, Reichardt (working with screenwriting partner Jon Raymond) suggests that united as they may seem, the main characters have arrived at their extremism from different paths and places: Josh, who rarely thinks out loud or justifies his actions, seems to be the most persuaded of the three; Dena’s anti-establishment, ecologically inclined views may or may not stem from a reflex of rebellion against her privileged upbringing; and Harmon sometimes appears to be torn between revolution and pursuit of pleasure. In the film’s second half, we see these three commit their act of “eco-terrorism”—and then deal with the aftermath. Reichardt’s characteristically thoughtful, unobtrusive style, a model of visual precision and economy, turns slightly more voluptuous as the story darkens, winding its way through some surprising twists. The final act of Night Moves finds the filmmaker using music, shadow and light, close-ups and atypically dramatic camera angles to gently push the tension to its limits. Meanwhile, images and moments from early in the film—women emerging from a sauna, a shot of Josh’s trembling hands, an encounter with a garrulous hiker—take on new meaning in the closing sequences. Sarsgaard is terrific, as always, but Night Moves hinges mainly on the other two leads, both superb. Eisenberg usually plays chatty neurotics, but he has a coiled, mysterious quality here; he makes Josh both frightening and fragile. Fanning, who began her career as an eerily self-assured child actress, has mellowed into a distinctive adult screen presence, with slightly smudged-looking features and a soft voice that fools you into thinking she’s barely acting. Most gratifying of all, though, is the way Night Moves shows Reichardt developing and refining both her craft and her thematic obsessions. Her films have all dealt in some way with Americans struggling against the dominant ethos of their time: Old Joy revolved around the fraying bond between an upwardly mobile thirty-something and his hippie-dippy childhood friend; Wendy and Lucy followed a cash-strapped female drifter whose desperate search for her lost dog gradually reveals just how far outside society she has strayed; and in Meek’s Cutoff, a pioneer woman comes to realize her discomfort with the submissive role imposed on both her and the Native Americans living on the land she and her husband are trying to find and settle. In Night Moves, Reichardt continues exploring her ideas about the limitations, pressures and dilemmas of American non-conformism. Like most good filmmakers, she discovers more questions than answers. But in the process, she secures her spot as one of the very best US directors working today. The biggest competition crowd-pleaser—the film that generated the most laughter, tears and applause—has been British director Stephen Frears’s Philomena, starring Judi Dench as an Irish woman who enlists former BBC reporter Martin Sixsmith (played by Steve Coogan) to help find her long-lost son. The film is based on a true story: Philomena Lee was one of many “fallen” Irish women in the 1950s shamed into giving up babies they had out of wedlock to nuns, who, in turn, sold them to wealthy American couples looking to adopt. Frears gives the story a slick makeover, blending melodrama and comedy with brisk professionalism and a hearty helping of schmaltz. Despite moments of wit (the director wrings odd-couple humor from the relationship between working-class, devoutly Catholic Philomena and posh, cynical atheist Sixsmith), Philomena is essentially a tearjerker, complete with a cloying score from Alexandre Desplat. Dench and Coogan sell it well, occasionally cutting through the high-minded sentiment to dig up some real emotion. But coming from the director who gave us films like the nimble, imaginative The Queen and the delicious noir The Grifters, this is far from Frears at his best. 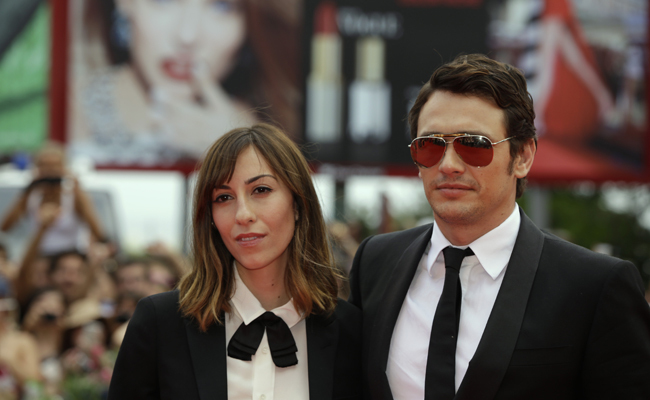 Meanwhile, the biggest attraction for the Italian fan girls camped out next to the red carpet was US actor-director-writer-provocateur James Franco. His arrival for the screening of his competition entry Child of God (adapted from the Cormac McCarthy novel) drew screams and even a collective lunge, deftly contained by a couple of good-humored security guards. It was the most rapturous response to a star that I’ve seen here yet—tied, perhaps, with the stampede of fans who nearly ran me over while chasing a limo bringing Daniel Radcliffe (aka Harry Potter) from the festival premises to his hotel. As for Franco’s film itself, the reception was cooler. The story of Lester Ballard, a roving, raving outcast prone to bursts of violence and necrophilia in 1950s Tennessee, Child of God is shot with rough, raw energy and steeped in a suitably barren Southern atmosphere. It’s also a chore to sit through: a dramatically shapeless movie which demands that we accompany the scowling anti-hero while he wanders, rapes, defecates and yells until he froths at the mouth for 104 very slow-moving minutes. The little-known Scott Haze sinks his teeth into the main role with theatrical glee, doing everything short of grabbing the camera and swallowing it whole. His is the kind of grating, fully committed performance that the jury may choose to reward. Much to the excitement of his autograph-hungry groupies, Franco showed up a second time to help present Palo Alto, the debut film from Gia Coppola (Francis Ford Coppola’s granddaughter), which is based on Franco’s book Palo Alto Stories and features the actor in a supporting role. The film treads no new narrative or stylistic ground; it’s a look at the lives of unhappy, privileged white teens in the northern California suburb of the title, and Coppola is clearly going for the dreamy lyricism that characterizes her aunt Sofia’s work. But Palo Alto is an example of how to turn been-there-done-that material into something luminous. Following the obnoxious Fred (Nat Wolff), his quieter sidekick Teddy (Jack Kilmer, son of Val), pretty, pensive April (Emma Roberts, niece of Julia) and boy-crazy Emily (Zoe Levin) through the usual rites of smoking, drinking, hooking up, and hanging out, Coppola crafts fresh images that are alive both to her subjects’ churning sexuality and their inner lives. The filmmaker proves especially empathetic toward the female characters, who learn some hard lessons through their dealings with the men that surround them (including the seductive soccer coach played by a very good Franco). Coppola also displays a sure hand with her cast, most notably coaxing a radiant, star-making turn from Roberts as an object of desire still learning how to articulate what she herself wants. If the impact of Palo Alto is significantly limited by the familiarity of the story, its depiction of adolescent behavior—the forced apathy, the impulsiveness, the tendency to do things that can’t be explained rationally—rings true. Coppola is a talent to watch. Another first film, Peter Landesman’s Parkland, was less impressive. A reconstitution of the three days following JFK’s assassination in 1963, the film, which screened in competition on Sunday, starts off well. The director makes fine use of handheld camerawork and quick editing in scenes of secret service agents scrambling in the wake of the shooting, while hospital-set sequences, in which a shell-shocked young resident (Zac Efron) and head nurse (Marcia Gay Harden) try to resuscitate the president, are tense and stirring. But once Kennedy is pronounced dead, Parkland goes downhill fast, with a tone of TV-movie solemnity, epitomized by James Newton Howard’s heavy-handed score, taking over. Things get flat-out weird—and not in a good way—when the usually reliable Jacki Weaver (Silver Linings Playbook) enters the picture as Lee Harvey Oswald’s kooky mother, Marguerite. Her howler of a performance—shrill voice, erratic accent, cartoonish facial expressions—nudges the film toward camp, which is unfortunate for what is meant to be a portrait of a wrenching American moment. Parkland isn’t bad, exactly. But the director hasn’t found a way to make his glimpse at the immediate aftermath of one of the defining traumas of contemporary US history feel urgent. On the contrary, the film ends up feeling unnecessary and undistinguished. Aside from the fact that November will mark the 50th anniversary of JFK’s death, why make this movie now? Versions of this post also appear on France 24, an Atlantic partner site.